For all of you moms out there that have little girls, how many times have you been spritzing on your perfume, fixing your hair or putting on your makeup when your little girl comes in and wants to "look like mommy too"? I cannot tell you just how many times my 5 year old has walked in on me getting ready for the day and asks to have some of whatever I am applying. She loves to wear my hair barrettes and sneaks my perfume once in awhile. Sometimes her room smells just like my perfume and I know what she has been up to. 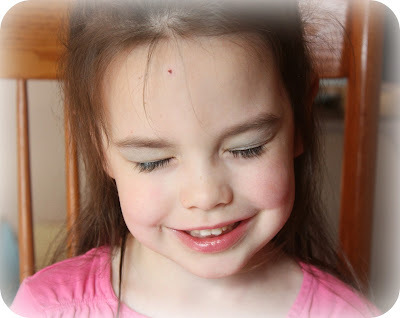 :) She watches me put on a bit of makeup when I am getting ready for a dinner date with daddy and of course, asks 101 questions about what I am doing and where I am going and when she can wear what I am wearing. I always knew that having a little girl would be fun, I just didn't realize how much she would want to be like me! When it comes to any type of beauty product for my daughter, I like to use products that are as natural as I can find. These days, not too many manufacturers take children's sensitive and "young" skin into consideration so when I find a company that focuses on clean products for children, I tend to stick with them. 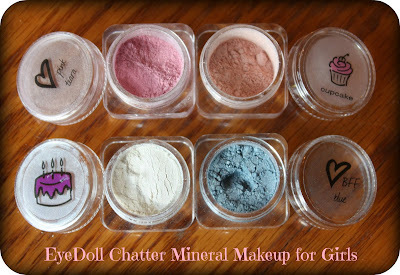 Recently, I became acquainted with a company called EyeDoll Chatter and they make natural, scented mineral makeup for girls! 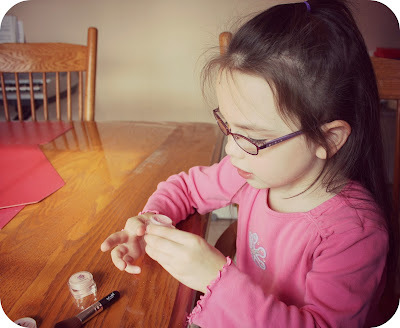 So, for the purpose of this review I was sent some products from EyeDoll Chatter to share with my daughter and also with you! I was sent two lip gloss minis in Strawberry and SRSLY Scarlet and an application brush, two blush minis in Cupcake and Pink Tiara with an application brush and eye shimmers/colors in Birthday Cake and BFF Blue, along with another application brush. These 2.5 gram containers are the perfect size for little girls and the brushes are also small and cute...which I really loved. I was not sure how using this makeup would go but my daughter begged me to try it so we sat down one day and gave it a whirl. 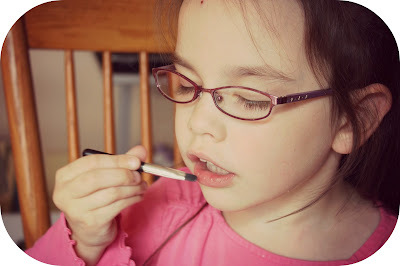 She got right into it and we first began with the lip gloss. She loves both colors and I love the fact that she can use either colored or clear. 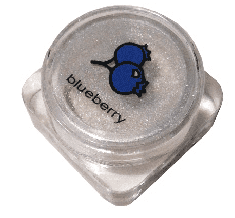 The actual gloss itself is easy to apply and isn't hard to get out of the container either. Oh, she felt like a real lady putting on her lip gloss. :) The lip gloss comes in six fun flavors/colors - SRSLY Scarlet, Strawberry, QT Sparkle Lip Gloss, P911 Pink Lip Gloss, Lemonade flavored and Banana flavored. 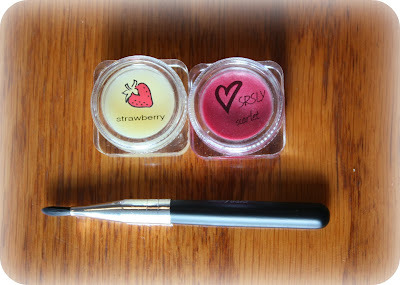 Each mini lip gloss retails for $4.00 or you can get a multi-pack containing 6 minis for $15.00. Hannah did have some help from mommy when it came to the blush as it kind of gets out of control if you don't just use a little bit. She smiled the entire time I swept the brush across her cheeks. These colors are so subtle and look so great when applied...it's no wonder they are such a hit with girls! Like the lip gloss, the blush comes in 6 flavors/scents and is also available in the multi-pack. Prices are the same as the lip gloss as well. So, doesn't my pretty little girl look lovely?? I just love the quiet, gentle colors. She has really sensitive skin and this mineral-based makeup does not effect her skin at all. She is fair skinned and it is nice to have something simple that she can use to make her feel just a tiny bit prettier. Every day since we have tried out this makeup, she has asked for me to help her put it on and she loves to wear it as much as I allow her to. So, if you would like to find out more information about EyeDoll Chatter, be sure to check out their website and also give them a "Like" on Facebook! They are a wonderful company and would certainly give you many options for gift giving this holiday season. I would definitely recommend them and my daughter and I love the look that this makeup gives us!! Check it out today and make your little girl just a bit more excited to look like mommy! Disclaimer: I received no monetary compensation for this post. I did receive free EyeDoll Chatter products for review purposes. All quotes and stock photos are from the EyeDoll Chatter website and email. All thoughts and opinions are 100% mine. Little girls are pretty just as they are.